One of my first posts on this blog way back in February (an eternity in blog-time) was an appreciation of garden writer Thalassa Cruso. Over the past months, the post has been one my most searched for and viewed pages. I wonder if that's because Thalassa has such a googlable name or perhaps it's because she is so often compared to that other PBS doyenne, Julia Child. 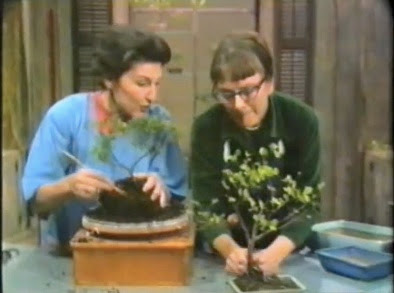 The other day Michael Weishan, garden author and former host of the Victory Garden, kindly contacted me and sent a link to a great post that he just put up about Ms. Cruso. Be sure to go take a look at his well-done blog Old House, Old Garden to see a wonderfully personal letter Ms. Cruso sent to Michael in reply to a fan letter he wrote her when he was thirteen. 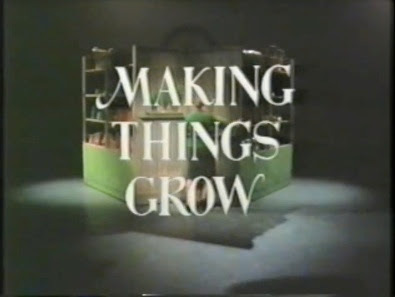 Most importantly he shares an episode of Thalassa Cruso's Making Things Grow PBS television show from 1967. I was never lucky enough to have seen any of these shows. According to Michael, the episodes aren't available anywhere because of the expense of restoring the old tapes at WGBH. In fact, Michael writes that that even the old VHS copy that he had copied snapped soon after he went to the trouble of digitizing the episode. Thankfully we can watch it now and see and hear Thalassa in all her British accented horticultural glory. She seems to be have been giving Julia a run for her money in terms of on-air eccentricity. An innovative group of gardeners are putting on a new three-day garden show at Cornerstone Gardens in a few weeks that will focus on climate change, drought, sustainable practices and renewable resources. If you are in the Bay Area this fall (or would like to travel there) please buy your tickets now. They have an impressive list of designers constructing show gardens as well as speakers and vendors. I wish I could be there!